We began the trip heading west through the shipping lane. We were 11 miles out when we spotted our first spout. After a few minutes, we were able to spot 10 humpback whales within a mile of us. A few of them came close to the boat. We saw several lunge feeds from these animals. There was also a lot of porpoise activity on this trip. We returned to the same spot 11 miles offshore for the next trip, where we found a pair of humpbacks. 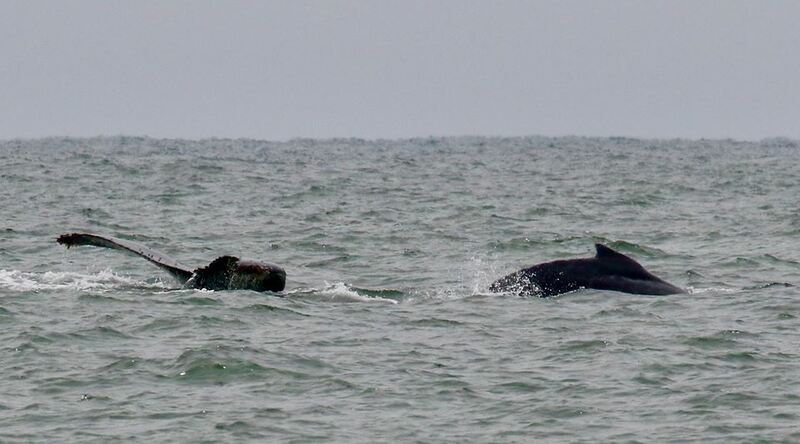 The smaller of the two individuals breached for almost the entire time we were there. It's possible that this was a calf. Another individual slapped its tail multiple times on the water, 500 yards from the breaching animal. There were a few lunge feeds on this trip, as well as a few fluke dives. There were some California sea lions resting on the shipping lane buoy. All sightings from San Francisco Whale Tours vessel Kitty Kat. All photos in this post taken by SFWT photographer Leigh. On this trip we were able to locate a mother humpback with her calf in out in the shipping lane between buoys 3 and 4. 3-4 large container ships passed by the whales while we were there. We made sure they had plenty of space while other vessels were present. 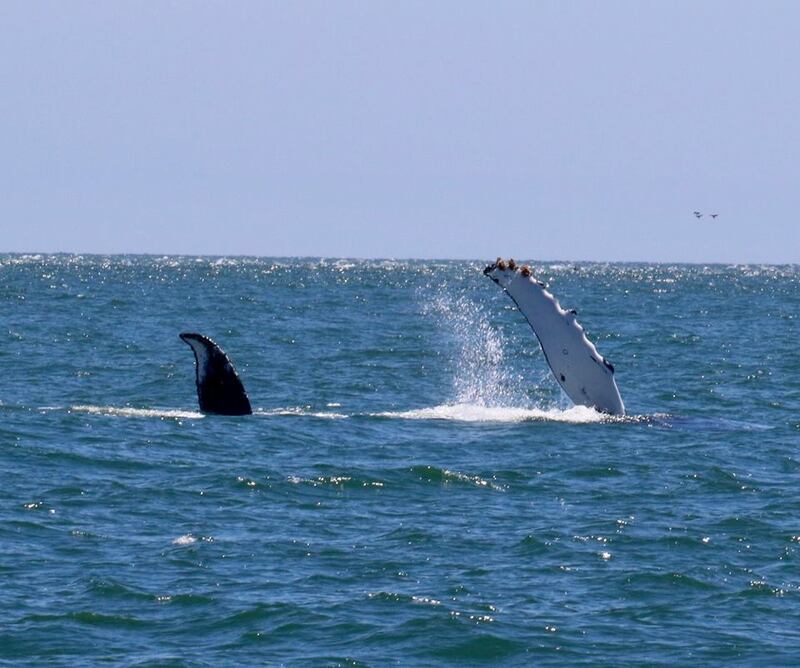 The two were not fluking much, although we saw a few fluke dives from the calf. They were slowly heading west. We spotted another spout a little bit farther north. The whale started moving east towards the bridge, and we followed at a distance until we moved back towards port. On this trip a crew member spotted a breach at Mile Rock while we were still under the bridge. The humpback whale continued to breach, followed by several pectoral slaps. We also saw several fluke dives. The whale slowly moved east, breaching and slapping continuously. 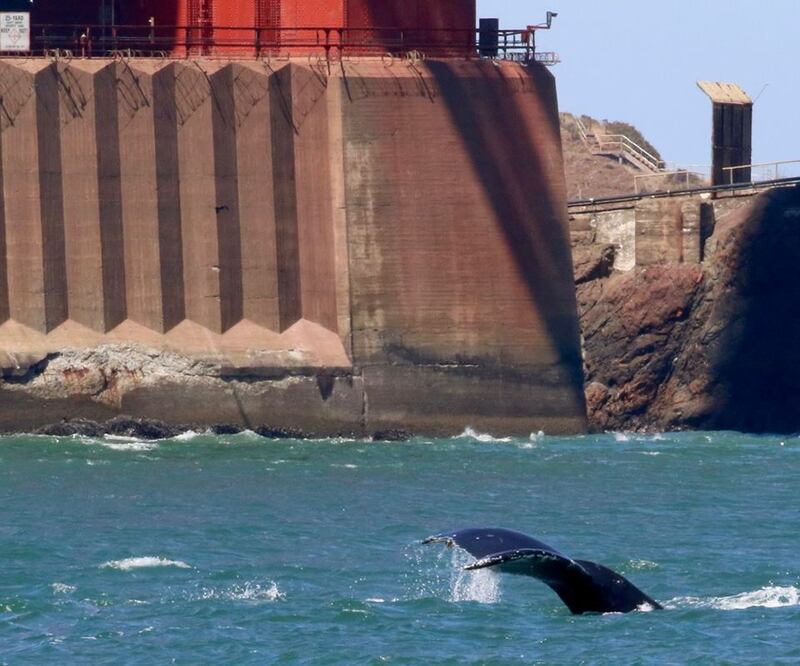 A large container ship passed by us and the whale moved in to Kirby Cove, where we saw a breach in front of the Golden Gate Bridge. It then traveled all the way across to Fort Point and then back to the bridge. We also spotted lots of harbor porpoises near the end of the trip.